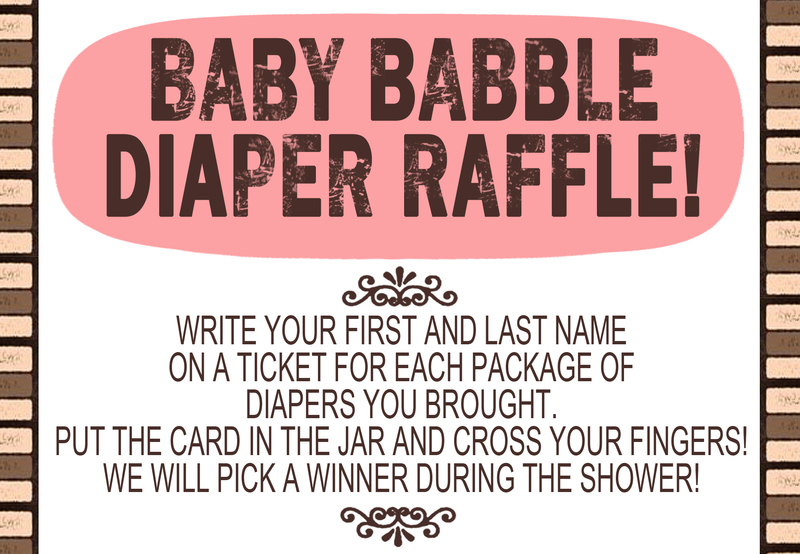 This is so easy and cost-effective if you have multiple recipients. 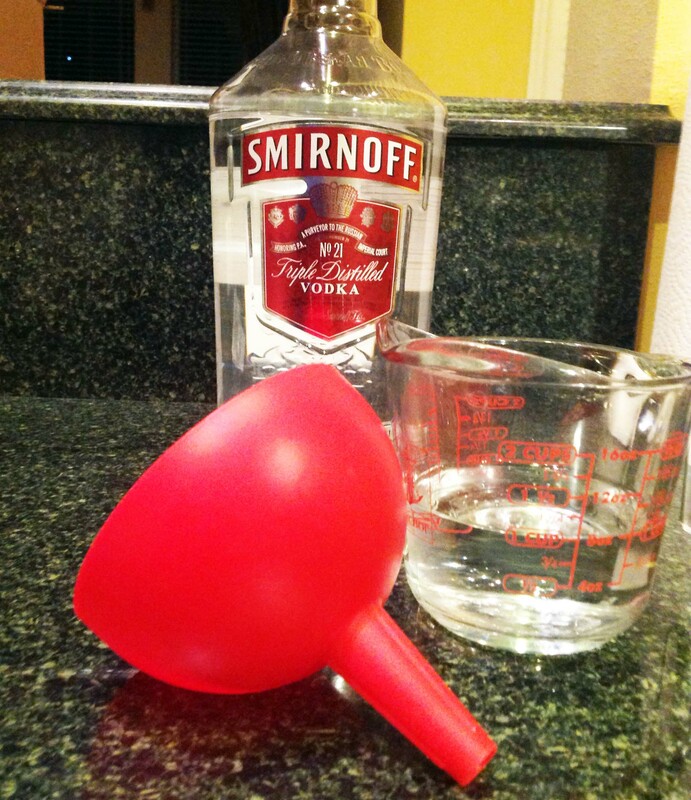 Begin by measuring your vodka and pouring it into the containers. The glass flask was purchased at the Container Store and holds 8.5 oz. 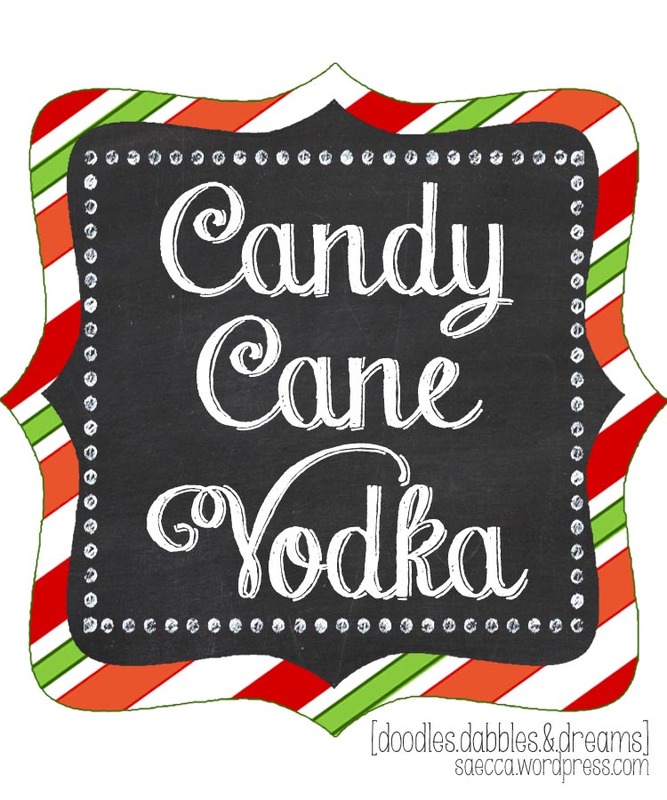 There are some recipes out there that will tell you to pulverize your candy canes into a dust then add that to your vodka and shake. That is a fast alternative, but this recipe is more of a day or two recipe. 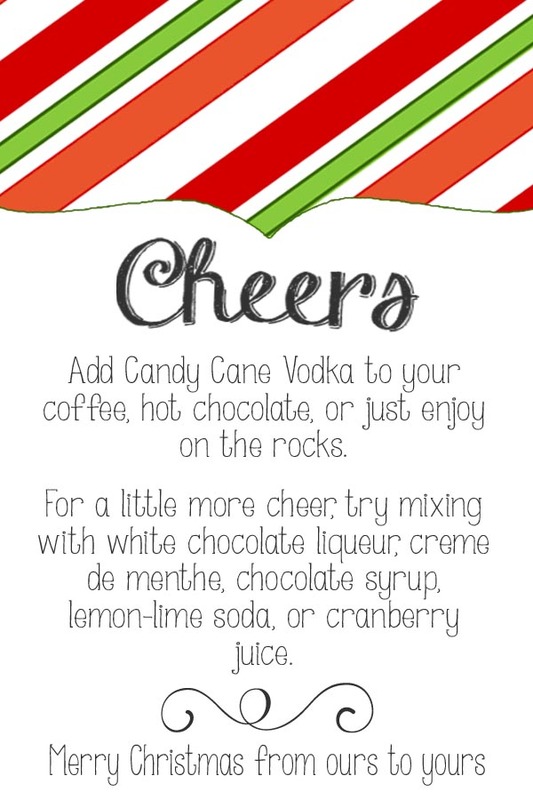 For this recipe, I found that I used 5-6 candy canes per 8 oz. You will need to taste them to ensure there is enough sweetness to peppermint ratio. It is all about personal preference, so you can increase or decrease as required. 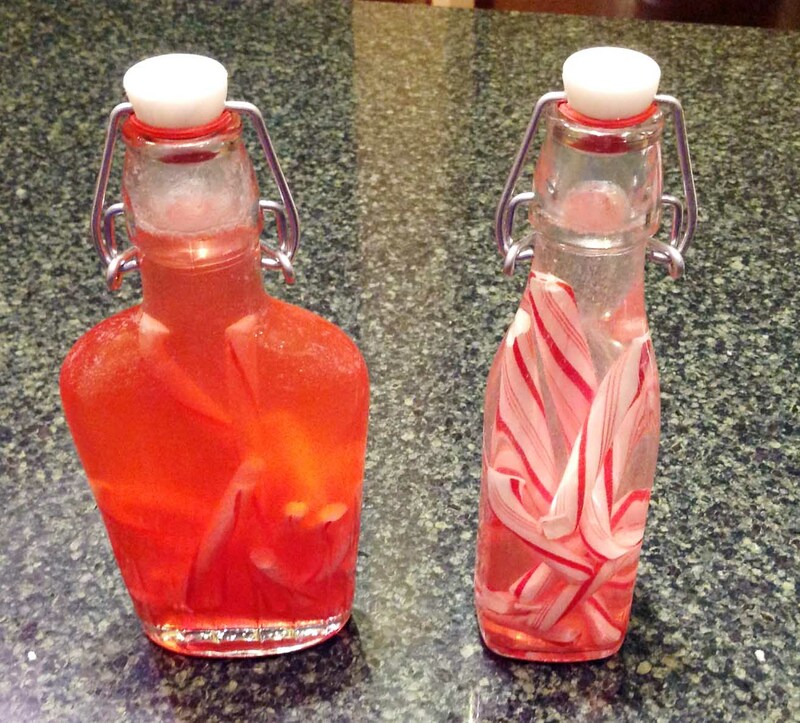 Using 6 candy canes in my bottles created a sweeter drink that actually tasted pretty darn good by itself. Open the candy canes and break apart. Place into the glasses and THEN add the vodka. I did it the other way around and I neglected to remember that whole water displacement thing and had to pour some vodka out (hence the second bottle seen below). Also, when the candy canes get wet from the vodka, they are very sticky and hard to move around. 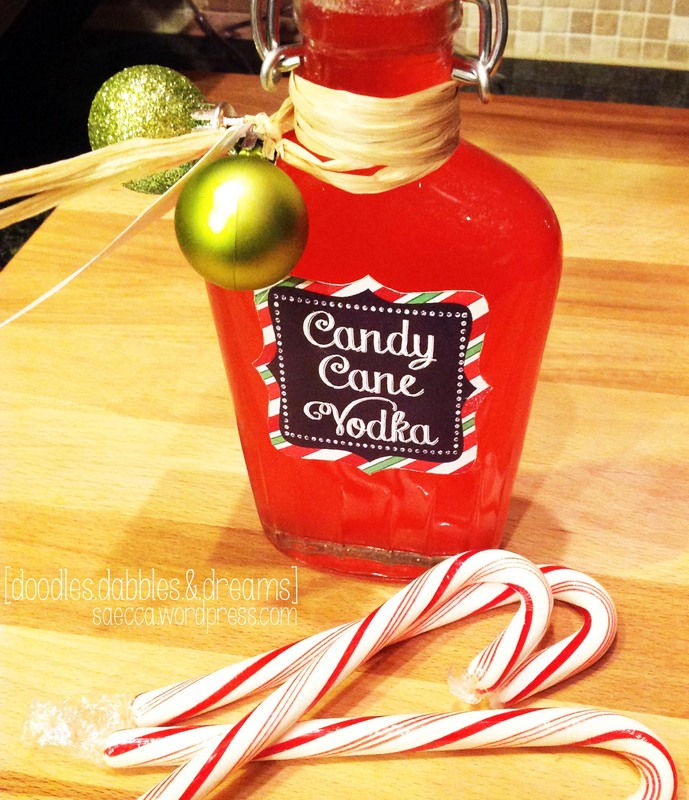 Once you have all your candy canes and vodka together, you’re done. No, seriously. 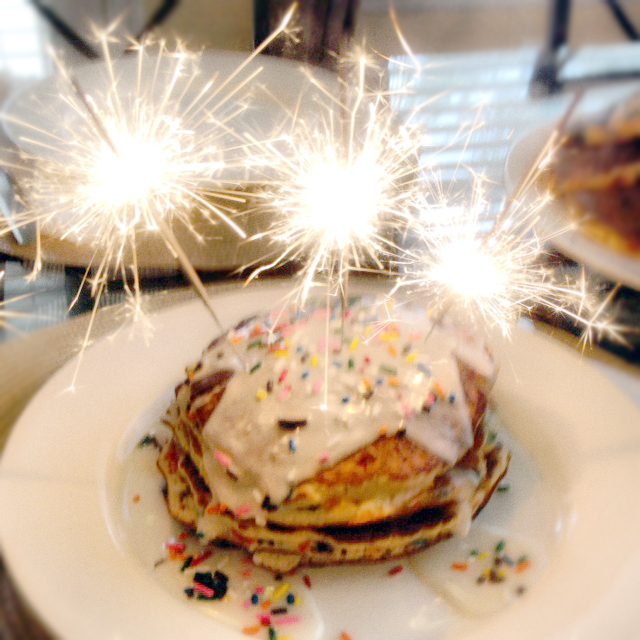 That is all that needs to happen for this awesome homemade gift. The process of the candy canes dissolving is relatively quick. The flask was made about 20 minutes before the bottle on the right. I did just let them sit over night and agitated them a few times to make sure there were no pieces left inside. Next, add a label to personalize the bottle. I went with a rustic theme because it seemed to fit my homemade vibe for this project. 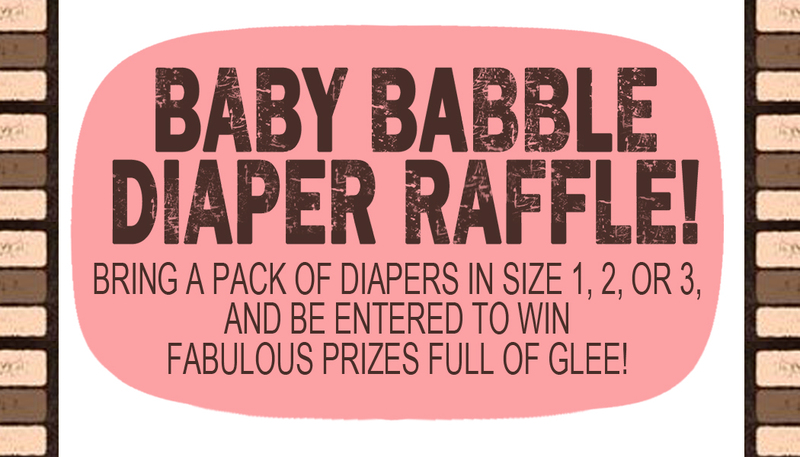 Here is the label and tag I created. The fonts are available at DaFont.com (Main titles, text). I also picked up some little ornaments from a big box store to add a little flair to my bottle. All in all, this project is super easy and economical. I plan on getting about 8 presents done with one 1.75 liter bottle and 48 or so candy canes. I might pair this gift with two hot chocolate packets just for something extra and to encourage them to try it right away. Oh- and did I mention that I slightly abhor liquor and this I actually enjoy it straight with nothing added. I can only imagine how amazing the coffee or hot chocolate version tastes! For more recipes that you could include, visit here. Well, bear with me on this one. Hubs and I joined a kickball league, and we recently had a theme night where each team had to dress up. Our theme was “Paranormal Activity”. We all dressed up as ghosts, but we dressed up as silly ghosts– we had an Elvis ghost, pig ghost, clown ghost…you get the point. It was an easy and cheap costume for a bunch of working adults –we all just threw white sheets over us ($5.00 twin flat sheet at Wal-Mart) and worked with what we had at home (it’s very hard to find cheap costumes in May). In fact, we actually won the prize for best group costume! We also had a team member all dressed in black running around pretending to “capture” us on videos and audio recorders. Anyways, enough of the background, I went as a Censored Ghost. Here is a mini tutorial that might be useful when Halloween actually comes around….five months from now. First is to use a word processor to write the words to cut out. I reversed them because I did not want to see the black line when I did cut the letters out. I do have a Cricut, but I was at work doing this last-minute (theme night was that night), and it’s not really that many letters. Print two for both areas for a girl and only one for a guy. 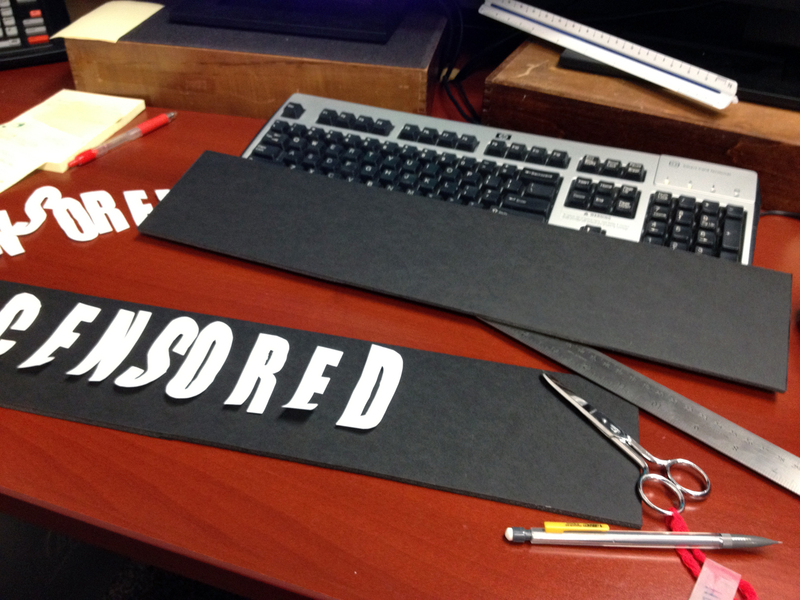 Next, I cut the letters out and glued them on to black foam core. I held a measuring stick up to make sure the square would be large enough against my own body. Finally, using my flat sheet, I glued Velcro on the sheet and the sign with fabric glue. I put the bottom sign at a slight angle. This whole costume cost less that $10. It only cost that much because I had to buy the Velcro– but if you just directly glued it on, it would be cheaper. To start is the cover. 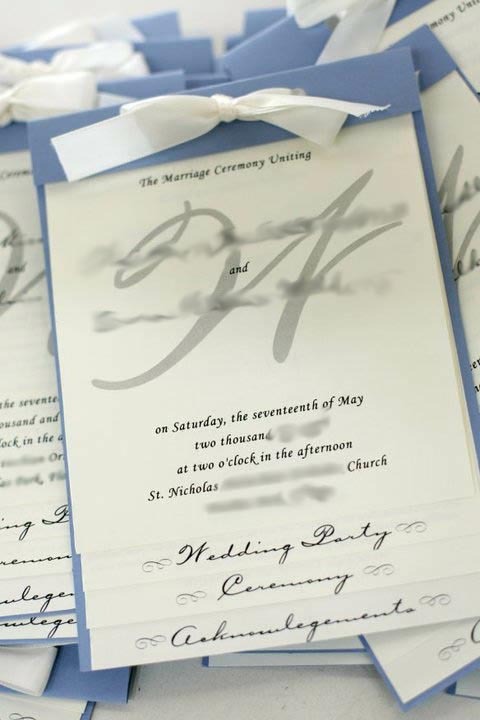 The image above included the couple’s wedding monogram which was repeated on their invitations, place cards, and thank you notes. The cover needs to state the typical who, what, where, and when. The cover can be traditional or modern. This paper is based on US letter paper (8.5″ x 11″). To get the most out of each sheet, the paper was landscaped and allowed for two program pages per prints (trust me– any time-saving tricks help when you are making 150 of them!). Next is to decide how many pages you will have. With the program being layered, every added pages makes the top pages shorter. This program chose to have four pages. 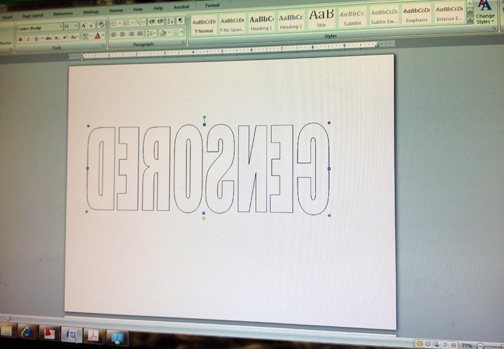 Depending on your font size and printer margins, create guides to go up equal spacing from the bottom. The example below had printer margins of 0.25 and used a half-inch for each page’s writing. 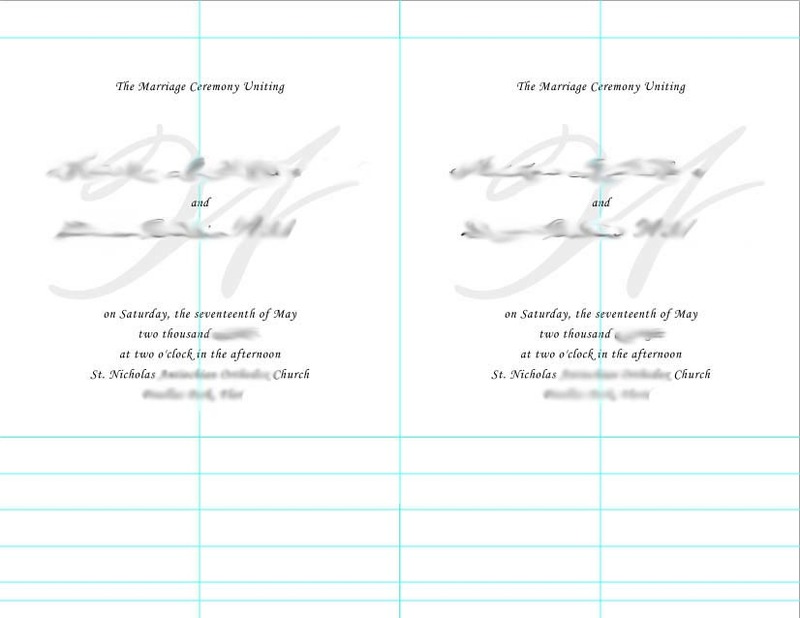 The printer margin also allows for colored card stock to show up at the bottom. Don’t forget to leave a half-inch or more for the fold down of the card stock!! Then as you go through each page, the text can become longer. Here is a the last page where you can see the same guides as the first page, but how it has moved down. 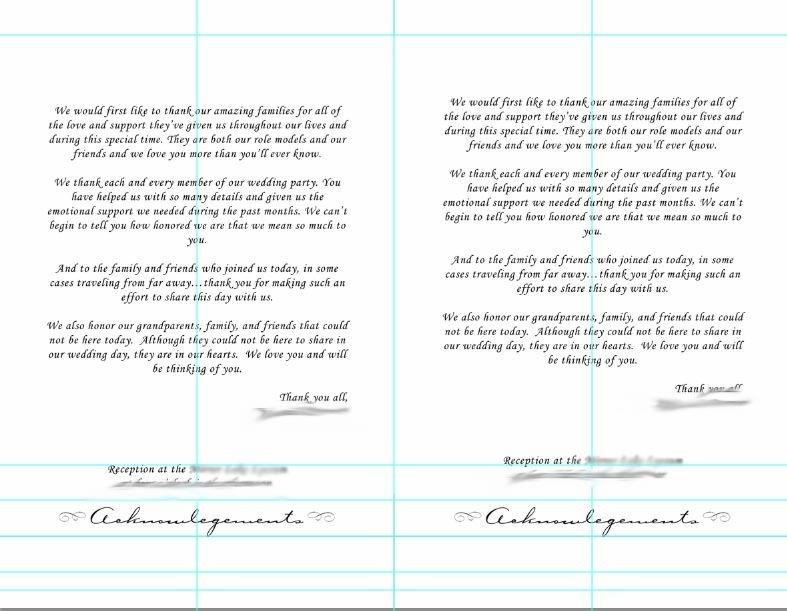 Finally, the cutting out is condensed because you can layer three or four pages and use a paper-cutter. I decided to cut off some of the sides as well to make the card stock present on the sides. Once all the pages are cut out, assemble them in the correct order. Cut the card stock in half and fold down the half-inch we left at the top. I used the edge of a ruler to get that perfect edge, but a scorer would work too. Once the card stock and the pages are lined up, places two holes for the ribbon to slip through (I neglected to get any pictures of this, but it is easy). Then simply tie them together! You now have a beautifully personalized program! Ever notice how your makeup bag seems to be a bottomless pit of lip-glosses-long-forgotten? That’s where my mascara went! There’s that button that came off! How’d that tennis racquet get in there?? Okay, maybe that last one is a stretch, but there are simple steps to disarm the bag-that-time-forgot. One way to start is to compile all those makeup brushes. Who hasn’t mercilessly dug through a bag and inevitably always ends up pulling out the wrong one? Taking a toothbrush holder is an easy (an attractive) way to keep your brushes out of the way and always have them on hand. Another good aspect is the whole thing can be easily put in a cabinet without falling all over. So, with the makeup brushes conquered, maybe I can finally finish a whole lip gloss without losing it! Imagine having 30 kids that constantly are looking to you for six hours a day for 180 days every year. No, you are not part of the Duggar family, you are a teacher. One of those hard working, under appreciated breed of men and women that day in and day out give it their all to better our future, one child at a time. Every year in May, Teacher Appreciation Day comes around. Here are some ideas that let your child’s teacher know they are doing a great job. Also, if you can read this, don’t forget to thank a teacher! !